Hugh son of Thurstan and Margaret was born about 1370; he succeeded brother Thomas in the tenure of the Wardley and Tyldesley estates. Like Thomas he was much absent from Lancashire. He entered the service of Thomas le Despenser, Earl of Gloucester, became his retainer and followed his political star, as far as was safe. For Despenser had supported Richard II and after the usurpation of the crown, he was active in conspiracy against the Lancastrian, Henry IV. 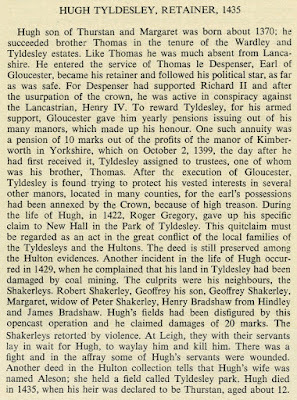 To reward Tyldesley, for his armed support, Gloucester gave him yearly pensions issuing out of his many manors, which made up his honour. One such annuity was a pension of 10 marks out of the profits of the manor of Kimber-worth in Yorkshire, which on October 2, 1399, the day after he had first received it, Tyldesley assigned to trustees, one of whom was his brother, Thomas. 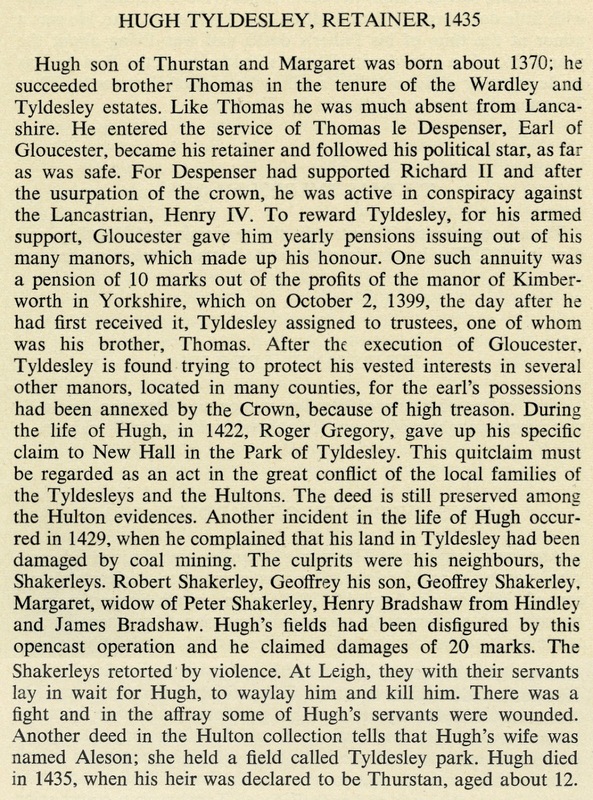 After the execution of Gloucester, Tyldesley is found trying to protect his vested interests in several other manors, located in many counties, for the earl's possessions had been annexed by the Crown, because of high treason. During the life of Hugh, in 1422, Roger Gregory, gave up his specific claim to New Hall in the Park of Tyldesley. This quitclaim must be regarded as an act in the great conflict of the local families of the Tyldesleys and the Hultons. The deed is still preserved among the Hulton evidences. Another incident in the life of Hugh occurred in 1429, when he complained that his land in Tyldesley had been damaged by coal mining. The culprits were his neighbours, the Shakerleys. Robert Shakerley, Geoffrey his son, Geoffrey Shakerley, Margaret, widow of Peter Shakerley, Henry Bradshaw from Hindley and James Bradshaw. Hugh's fields had been disfigured by this opencast operation and he claimed damages of 20 marks. The Shakerleys retorted by violence. At Leigh, they with their servants lay in wait for Hugh, to waylay him and kill him. There was a fight and in the affray some of Hugh's servants were wounded. Another deed in the Hulton collection tells that Hugh's wife was named Aleson; she held a field called Tyldesley park. Hugh died in 1435, when his heir was declared to be Thurstan, aged about 12.